I am practicing a rapid paint scheme for my Epic army. I wanted a traditional camo style which would look good on a dry arid terrain layout or on a greener lush board. I used paints from Privateer press and first took time to swatch and check the colours on some card before applying the colours. When I am happy with the results I will publish the colours used and a guide on youtube. 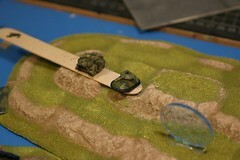 Here you can see a GZG hover tank and a Games Workshop Epic tank.